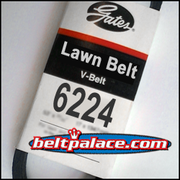 Gates 6224 Lawn Belt. Replacement belt for Lawn Equipment. Gates Special Belt 6224. Replacement belt. 17/32" top Width x 48-1/4" L. Gates V-belt. Also used in ATVs, Golf Carts, Snowmobiles, and Power Scooters.